Think about summer and your soul is already there in Greece. The island destination with its distinct architecture and sun-kissed landscape is not just beautiful but it is incredibly affordable. If you are one among the herd flocking to Greece, then you might want to know what you can do to make the most of your vacation. From exploring the ruins of Parthenon to shopping in Plaka, there is plenty to do and here are the 10 astonishing things to do in Greece. All up for a Greece holiday? Plan it now. Perched on top of a rocky terrain above the city of Athens, is one of the greatest architectural marvels of all time – the Acropolis of Athens. With evidence suggesting that the site was inhabited as early as the fourth millennium BC, you cannot help but wonder how genius of a work this is. Though the site was damaged during the 1687 siege, Acropolis of Athens is still a representation of classical Greece. Wear sturdy shoes, as the terrain is rocky and slippery. The level of heat in the Acropolis of Athens is really high, so try visiting the attraction early in the day or late evening. Climbing the Acropolis of Athens is one of the top things to do in Greece and the views from the top are breathtaking. As UNESCO world heritage site, Meteora is a natural masterpiece in Greece. While it is very easy to assume that these rock formations are from outer space, they are actually weathered by wind and water over all these years. 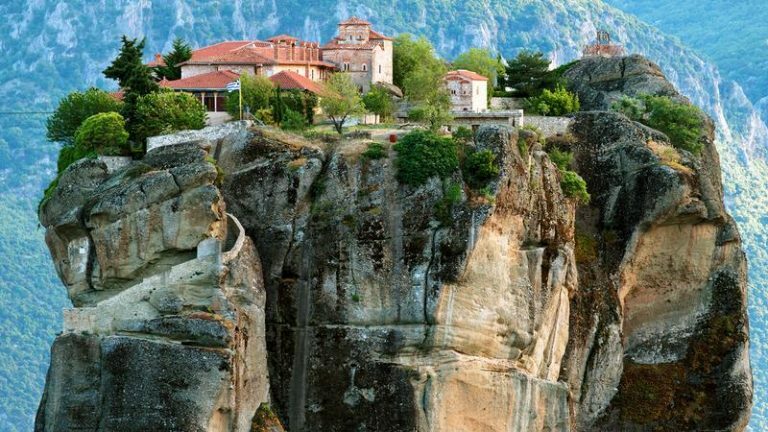 Adding to the extraordinary landscape of Meteora are six monasteries – Great Meteoron, Varlaam, St.Stephen, Holy Trinity, Rousanou and St. Nicholas Anapausas. Hike to the top of Meteora, bask in the spiritually enlightening atmosphere and catch an extraordinarily splendid sunset. Though a taxi from the train station can get you to the monasteries, hiking to the top will make your experience memorable. At the epicentre of Acropolis of Athens is the former Greek temple of Parthenon. 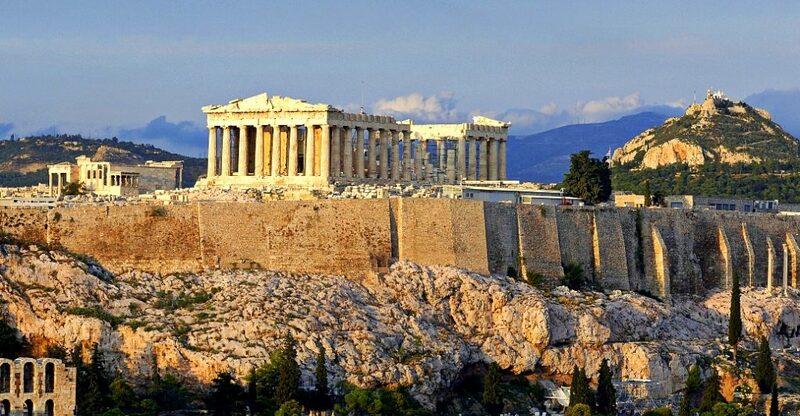 Dedicated to Goddess Athena, the construction of Parthenon started in 447 B.C. and is one of the oldest surviving buildings in Greece. 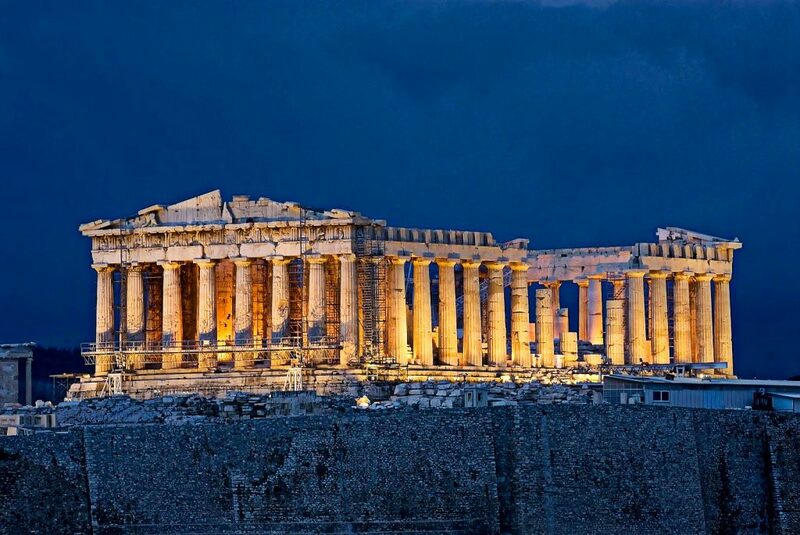 If you are a history lover, then Parthenon must be your top priority. Wonder in awe at the decorative sculptures which represent the highest form of Greek art, get enough of history and click a dozen photographs. Despite the restoration work which is going on, Parthenon is still a cultural treasure of Greece. The best way to obtain the most of the attraction is on a guided tour. 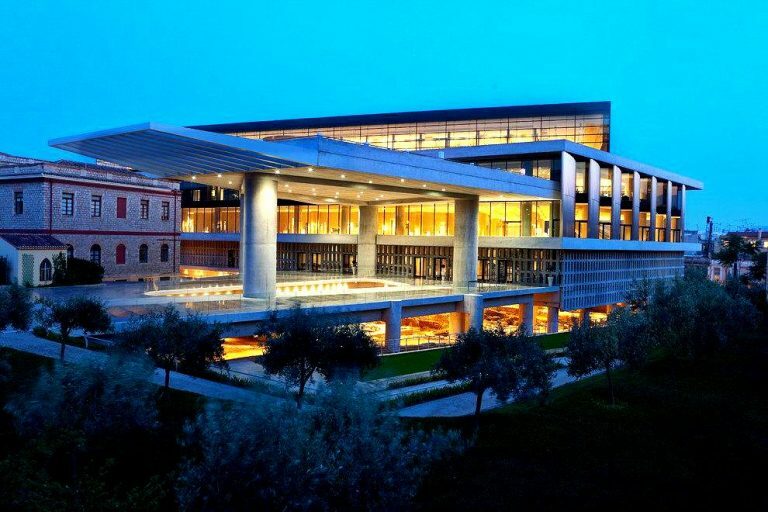 One of the famous things to do in Greece is to get around the Acropolis Museum. Why, you ask? The artefacts inside the museum will take you on an interesting journey of time. Consistently rated as one of the best museums in the world, the displays in the museum carry the findings from the Acropolis of Athens. From the Greek Bronze age to Roman and Byzantine, the layers of history on offer is immense. While the exhibits in the museum are from the past, they are presented in a modern, more advanced way keeping up with the trend. Popularly referred to as the ‘Neighborhood of the Gods’, Plaka is an old historical neighbourhood around Acropolis. Characterized by maze-like narrow lanes and neoclassical buildings, the fascinating district is immediately eye-catchy. 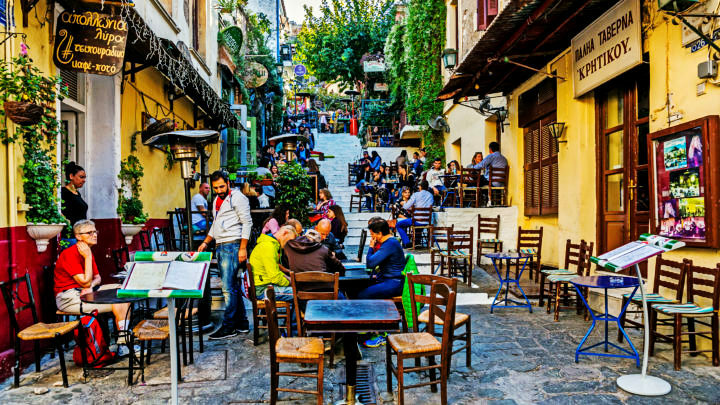 At every corner of Plaka are restaurants and souvenir shops that you should check out. From jewellery to handmade icons to wood carvings to antiques and postcards, there are plenty of souvenir options for you to choose from and gift to your loved ones back home. The perfect way to end your souvenir shopping is by dining at one of the many restaurants. Interested in going on a time travel to the Bronze age? No, we haven’t invented the time machine yet but you can still do that at the archaeological site of Knossos. 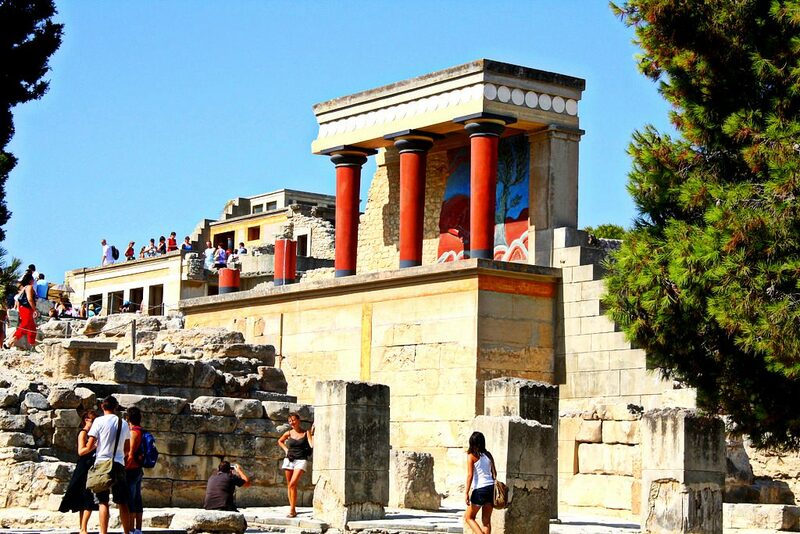 One of Europe’s oldest establishments, Knossos is an excellent place to be in and as per the evidence, the settlers were here as early as the Neolithic period. The ruins here are fascinating and there are so many references to the Greek mythology. To get a wholesome understanding of everything, take a guided tour of the attraction. Looking to beat the crowd and get the most of Knossos? Get there before 10 in the morning or head there later in the afternoon. Greece is known for its ancient ruins and architecture. But, when you have had enough of it, you actually wonder if anything other than this exists. Perhaps, some adventure? Surprisingly, it does. 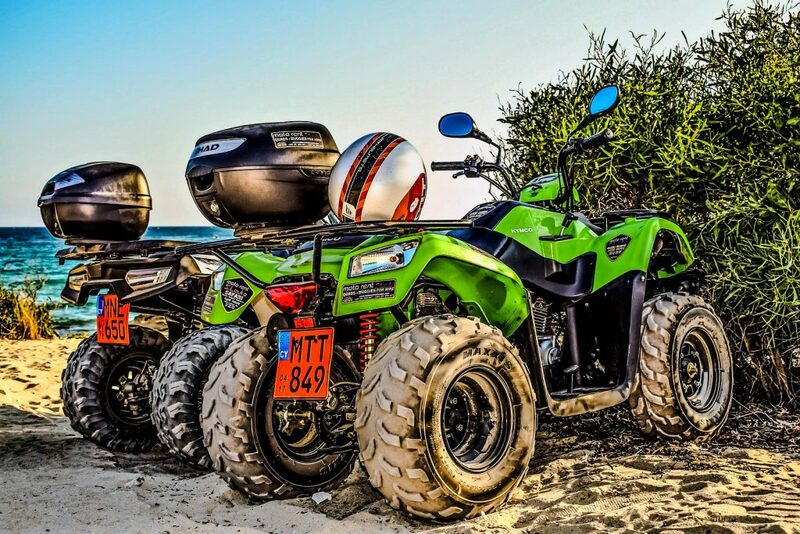 Try out the buggy adventure in Crete. The Cretan mountains in Greece offer the perfect terrain for this exhilarating experience. Traverse through the picturesque villages, mountain slopes and the olive groves on an off-road adventure that gives you access to some of the unexplored, remote areas of Crete. Stop for lunch at one of the many traditional Greek taverns and do click photographs on your way. The whole experience takes about 7-hrs and is one of the adventurous things to do in Greece. Coloured in soft pastels, the Pittaki Street near Monastiraki square in the gritty district of Psirri was once an abandoned industrial alleyway where people used to go only to pee. It was so shabby to the extent that the street was even referred to as a public toilet. But everything changed when a non-profit organization and a creative studio teamed up. 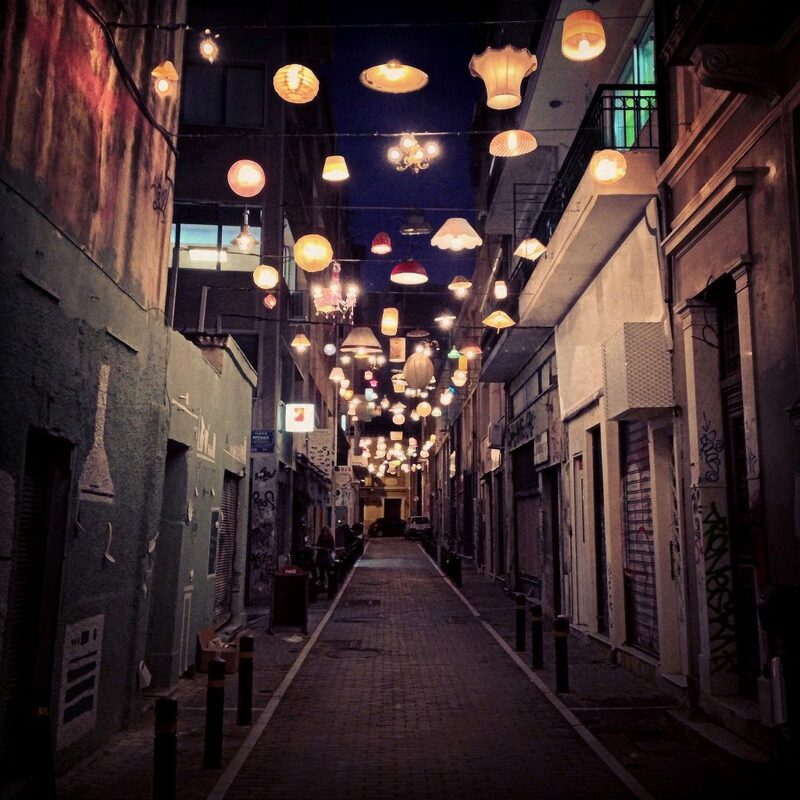 Lights of all kinds (chandeliers, lampshades, Chinese lanterns) were collected from Athens and these light installations were strung together in an artistic way, bringing in the charm and the spark that was missing. With everything in place, Pittaki Street soon became a photogenic spot. One of the unique things to do in Greece is to go wandering along the reinvented Pittaki Street. Wanna say ‘hello’ to nature? Take a trip to Elafonissi beach. The stunning sandy beach is beautiful year round and the crystal clear turquoise water is enough to sway you off your feet. Situated south of Crete, about 70 KMS from the city of Chania, visiting Elafonissi beach is a short trip in itself. 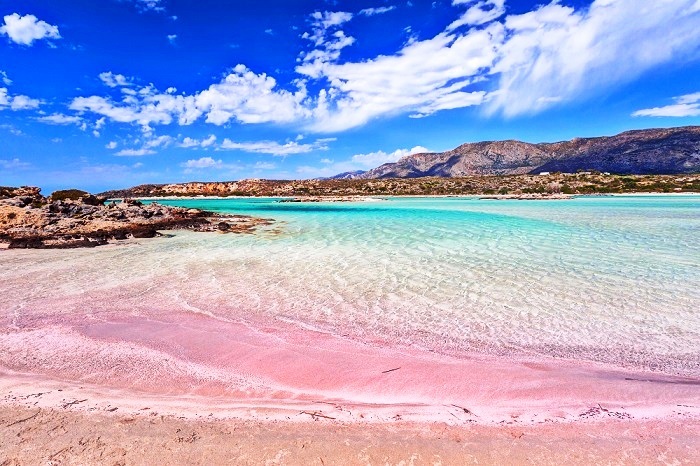 The sand here is pink-tinged and that adds to the exotic aura of the place. The water here is shallow, making it a great spot to be with your family. Pack a picnic, bring your children and teach them some swimming. Laze around the coast, Elafonissi beach is also home to a wide variety of plant species. Interesting read: Where to go in May – best places across the world! 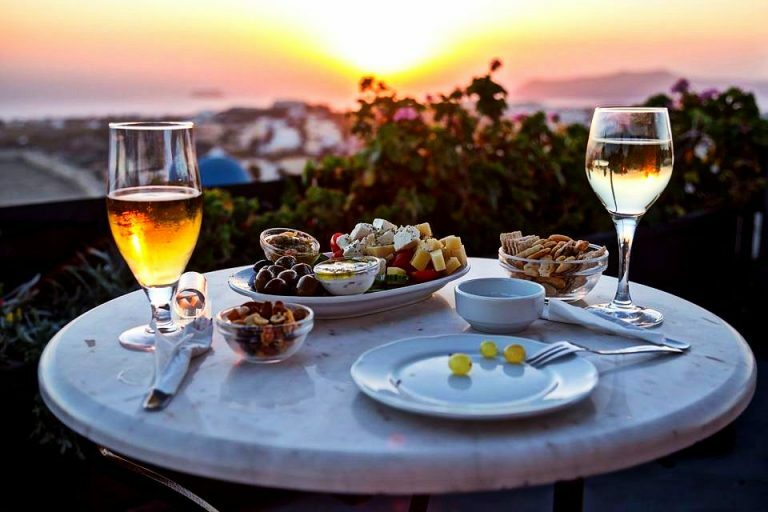 A trip to Greece is incomplete without wine tasting in Santorini. There are plenty of wineries in and around Santorini, so there is no problem in finding one. Enrol your name in a small wine tour, take a look around the vineyard with the help of a guide, learn the intricacies of producing wine, check out the wine cellars and do get to the top of wineries to catch a gorgeous sunset. Wine tasting in one of the favourite things to do in Greece Santorini for the tourists. All clear about what to do in Greece but no where close to the country? start planning your trip to Greece. It just takes 5 mins!